In stock. Order in the next 2 hours, 37 minutes and it will go out today! Greg McMahon is one of the true professionals in magic and clowning. 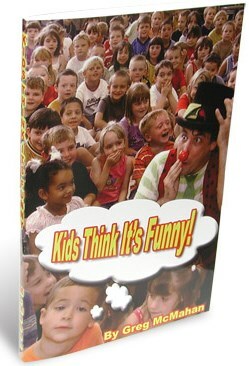 He's now revealing some of his best kid-show material in his new book, KIDS THINK IT'S FUNNY. In 27 unique and entertaining chapters, Greg teaches hilarious gags and routines to make you funnier than ever to your kid-show audiences! His tips on how to make a small show look big or his chapter on top hat juggling or his Rocky the Raccoon routines are easily worth much more than the price of the entire book. Greg has packed all of this into a neat book. Designed and typeset by the Wizard of Odd himself with illustrations by Mrs.Odd (first name: Pretty), and published by SPS Publications.